Review: It’s the time of year when we are past the season to be jolly and across the Oscar hopeful finish line of prestige pictures trying to make their end of the year release date cutoff. Now we’re into January, a month commonly known in Hollywood when studios will push their less than desirable products into theaters either hoping they will go away quietly or praying for a small miracle and have them catch fire with audiences and make them a buck or two. Over the last few years the films that tend to do the best are low impact horror thrillers that are good for a jolt or two and quickly forgotten. So it’s indeed a perfect time for Sony to release Escape Room, their modestly budgeted and mostly forgettable time waster thriller. Though it boasts a good director that has shown he knows a thing or two around this genre and a concept filled with intriguing opportunities, it winds up being a strictly mediocre effort that sacrifices early hints of creativity for a messy finale that fails to deliver. It’s not that good but if I’m being totally honest it’s also not that bad. Opening with my least favorite plot device, introducing a character in a dire situation and then flashing back “three days earlier”, Escape Room gathers six disparate strangers vying to win $10,000 if they can solve a new escape room that’s come to Chicago. Though it appears they have nothing in common, over the next 100 minutes we’ll learn why they were chosen and how it came to be they are involved in a game that gets more deadly the deeper they go into the labyrinthine rooms. Their weaknesses become their strengths and their paranoias become their downfall as each one faces their fears that pop up in a variety of ways. 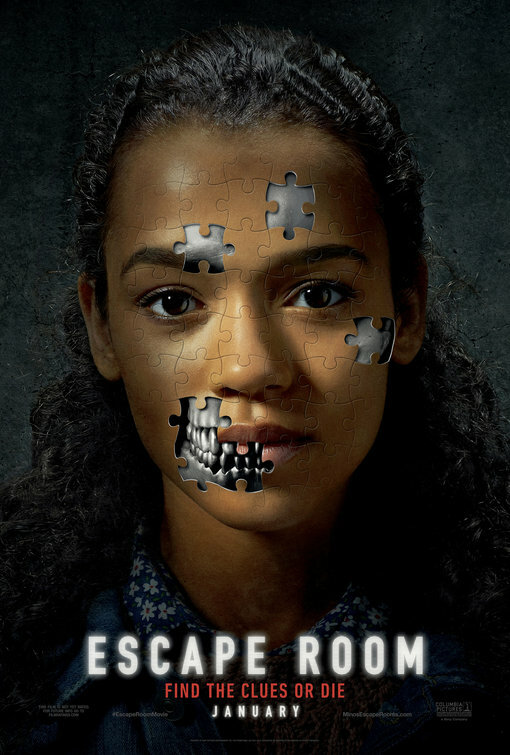 Those familiar with the Saw series or the cult classic Cube will find a lot of common threads here and Escape Room starts to feel like a Frankenstein monster of better movies the longer it goes on. Those movies at least had a concept that had an endgame, though, and it becomes clear around the halfway mark that screenwriters Bragi Schut and Maria Melnik may have had a beginning and end sketched out but failed to come up with enough twists and turns to keep the audience off balance. I kept waiting for the film to take a different path than what was expected but it kept motoring on with no surprises along the way. Even the escape rooms themselves start out with interesting clues to solve but gradually get less and less creative as the group moves forward and their numbers start to dwindle. Yet the movie moves swiftly without wasting unnecessary time in one location for too long. This notorious watch checker was surprised to see the first time he looked at his timepiece was 90 minutes into the film. Unfortunately, that’s when the film lost me in a major way with a bizarre denouement and even stranger stinger that didn’t feel like it matched up with the rest of the action. It felt like a studio mandated add-on to keep the door open for future sequels. Up until that point the movie had played mostly by the rules but then it seemed to toss out logic and reason in favor of extending the story past the closing credits. I wish the filmmakers had spent more time rounding out the rough edges of this movie before laying the groundwork for another. With movies like Aquaman, Mary Poppins Returns, and Bumblebee still easily occupying the top slots at the box office, Sony is hoping Escape Room might find a foothold with audiences that just want to sit back and not have to think too hard over what’s passing in front of their eyes on screen. Escape Room fits that bill and should easily make its money back in its first weekend. I’d say it’s one that you could hold off on catching in theaters, though, and put on your list for a rainy day at-home selection.